Why Businesses & Brands Should Use Foursquare? Foursquare is a location-based social networking platform and the king of location based Social Networks which operates as an app for your mobile phone and via the web. People use Foursquare to mainly check-in to locations (places) they’re visiting by using the app on their mobile phones. It is used to find the best place to go based on what the user’s friends recommend or have been to. People check-in to businesses in the real world and leave tips to tell others what they liked or disliked about the venue. Once a user check’s into a location, there is an option to share with their Foursquare friends, Facebook friends and Twitter followers. As smartphone use and purchases continue to go up, so will the check-in user base. Hartsfield-Jackson Atlanta International Airport became the first location on Foursquare to pass 1,000,000 check-ins. Foursquare takes advantage of the 3 biggest trends in the use of digital technology, Online Marketing: Social Media, Mobile Technology, with the beauty of location based service, what more do you want, user reviews and likes! This explosive growth means only one thing; your business must be on Foursquare. Best of all, it’s free. With Gowalla eaten up by Facebook, the check-in Apps arena is all within the reach of Foursquare, Facebook’s combined social, messaging and check-in App along with Google+ are the closest two platforms that are worth mentioning. Foursquare is winning the location based app game because it has the biggest user base, a well-developed gamified platform and is leading with constant developments, new online and in-app features, creating a very popular App for users, brands and businesses. If you have a local bricks and mortar business like a restaurant, café bar, museum, hotel, retail store or a venue with a physical store, Foursquare is the ideal social media platform to connect with existing customers, reward loyal customers and attract new followers. Do not under-estimate the power of Foursquare, its better than Yelp, Google Places and TripAdvisor. Why do customers “check-in” into places? Some people understand this concept while others don’t get the idea at all. People use Foursquare to check into locations they’ve visited by using the app on their smartphones. Once they’ve checked into a location, it can then be shared with their Foursquare friends, Facebook friends and Twitter followers. This is where companies on Foursquare can benefit from being on the platform, every time a user checks in, their friends see where they’re checking in to eat, shop, work, travel etc, which will influence them to do the same based on the recommendations of their trusted connections. Unlike Facebook which offers around 16% reach when you post an update, to improve their reach, Facebook wants page owners to pay to promote posts to a wider audience. Foursquare is still an under used social network and most of your competitors are most likely not using this as part of their marketing strategy to attract new customers. As a business taking action now will ensure you stay ahead of the game and lean from you experience before your competitors join the queue. Here are some of the reasons why people check-in? Power of Using Foursquare for Business? Small businesses now have the same resources available to them as a large multinational chain such as Starbucks or Gap, and that’s a really powerful tool and a game changer, creating a level playing field for local restaurants, retail stores, museums, local boutiques and other businesses. The Foursquare merchant platform for businesses allows venue owners to claim their venues already listed on Foursquare or add a new one if not listed already, create specials, and access tools that provide a greater insight into how users are interacting with the venue or the brand. Not every business has a bricks-and-mortar location, take MTV, History Channel, Bravo or Olympics for example. 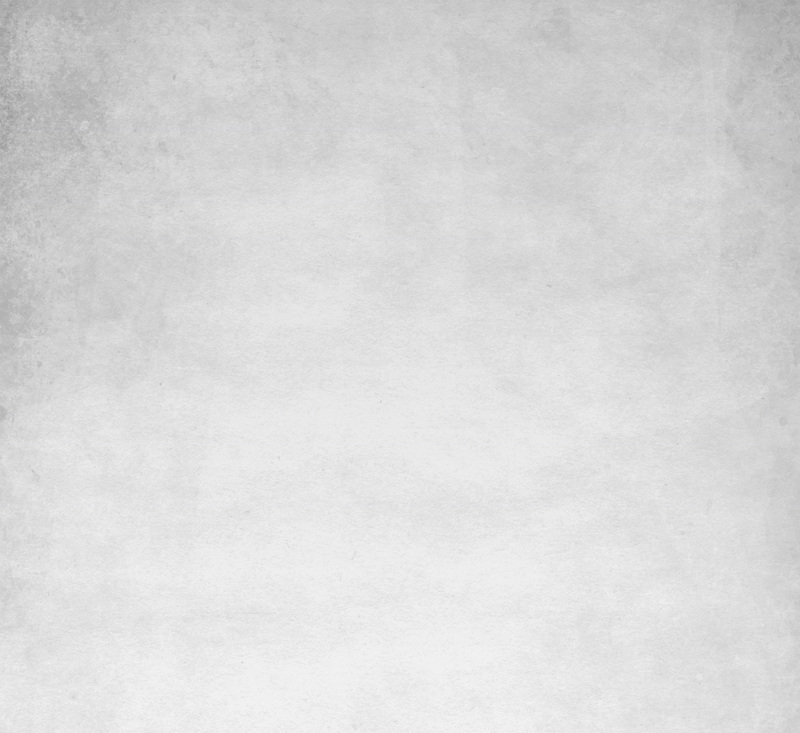 If your company is a brand without a physical presence you can use Foursquare Pages. Foursquare Brand Pages are for brands to have an online shop window and a cool way to interact with consumers. Use the free analytics to learn more about your real-world customers. When customers check in at your business, they’re sharing that experience with their friends. This means you can see who’s coming in for the first time, and how often they’re coming back. Measure your success. See how many check-ins you’re getting each week, and how many of those are being shared on Facebook and Twitter. Meet your best customers. Find out who the mayor of your business is (the person who visits the most!). What Can You Do with a Foursquare Page? A good idea at this stage would be to visit Foursquare and search for your business name and location, to find your business and to see if customers have check-in already. 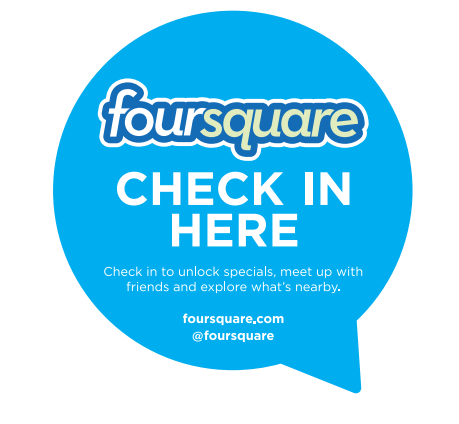 I would not worry if no one has checked-in, as this article shows you how to attract new customers with Foursquare. Why claim your venue? Millions of people can find your business through Foursquare. Claim your listing so you can make sure your information is up to date, and you can be found. When you claim your venue you also get access to Foursquare’s Merchant Tools, the ability to create local updates to share news with your customers and entice them to walk through your door. We think Foursquare is like a digital chalk-board for your business. Claim you venue by creating a Foursquare account and then click the “Claim here” link after “Do you manage this location?” at the bottom of the right sidebar. You have to verify your business online via a code and payment or wait for the pin to be posted to your physical address, and retry later. Foursquare offers excellent marketing opportunities for businesses, as a free platform for all types of businesses, you can’t go wrong by taking advantage of the opportunity. One of the ways in which you can do this is by offering specials to attract new customers or reward loyal existing customers. There are many types of specials that you can set up, so which one is best depends on your type of business and personal preference. We will cover in detail the full range of Foursquare specials you can offer along with examples of creative ways in which businesses are using this. 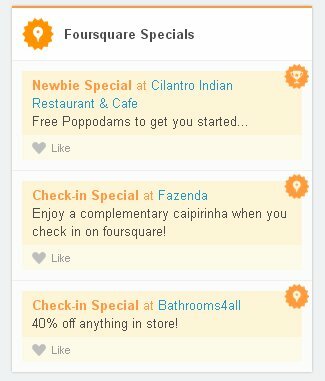 How Do Customers Find (Discover) Foursquare Specials? The Foursquare App and website has a feature called ‘Explore’ which shows all the businesses around that they can check-in. Users can search businesses nearby with specials, businesses that have created specials are highlighted with ‘special’ tag so you can clearly see and filter those businesses. An orange “Special” strip around the business name indicates that the venue has a current Foursquare Special. When a user checks in to a business, they get notified of a “special nearby”. By clicking the pop-up message they will be taken to your special. This means the customer will see your offer even when they check in to another business nearby. To fully benefit from this feature, create bold and aggressive specials that entice and attract customers using this strategy, as most of your competitors may have yet to consider this platform as a marketing tool. When potential customers are in the area, they’ll be attracted to your special and want to visit your business, or keep you in mind for the future. Foursquare Specials Businesses and Brands are Using? Think of Foursquare specials as your very own customer ‘Loyalty Card’ just like Boots, Tesco, Airmiles, Sainsbury’s and other similar loyalty card schemes. So offer a mix of incentives and not just something free for x number of check-ins. To maximise the benefits of this platform, you don’t want to create a boring or mediocre specials like most other businesses, for example 10% off, or spend £50 to get £5 off. You should be creative and aggressive with a special to attract new customers and generate buzz for your business. Be bold and do something that others are not doing. As a way to boost more foot traffic on days when you are quiet, offer 30-40% off Monday to Wednesdays between say 5-7pm if you checkin via Foursquare. Base the offers when you are less busy, and make the offer enticing to pull more people in and not just a few. Offers you could give away depend on your business, only you know what a good offer is and if it will bring in customers. Using Foursquare data get a feel of what specials are attracting new customers, change your specials often. Create new offers and be creative with special offers during days, weeks and on special festivals/events to attract more businesses. Test what works for your business, as this will engage new customers and at the same time keep old customers happy. Here is a rundown of all the seven Foursquare specials. Player around with the offers and learn what works for your business, once you get a good offer working, but build upon that. Designed to empower Foursquare user to checkin with friends to unlock this special, for example people get a free main Dish or Starter when they check in with 3 friends. That special is only redeemed when that pre-set number of friends check in together. The goal is to get groups of friends coming to your venue. You set a minimum number of Foursquare users that need to check in within a 3-hour window in order to unlock this Special. It can only be unlocked once per day per venue, and is a great way to incentivise large groups to visit your business! This special gets its name from ‘Flash Sale’ or ‘Happy Hour’. You set the number of Specials that you want to unlock per day, then after that its first-come, first-serve. When it reaches the unlock limit, there are no more Specials for the day. This is great for special limited quantity sales. Flash Specials are for special days such as holidays, special events for bars and restaurants think of match days, fight nights, grand national, valentine’s day, mother’s day etc. A way to entice (treat/reward) people who check in to your business for the first time. Offering a reward for a user’s first checkin, even if it’s a small one, like 10% off or a free drink to encourage them to visit your business. This is the most direct way to drive new traffic to your venue. Users unlock this on every check in, or on whatever conditions you apply. This is great for rewarding users on their routine check ins. The offer can be a reward for every single checkin, restaurants can offer a free drink or a discount, while retailers might offer a few pounds off a purchase. There are a few ways to use a loyalty Special. You can reward a user every 5th, 10th, 20th visit, or you can reward them for coming 15 times in total. Loyalty specials can be recurring (“every 3 checkins”) or not (“on your 3rd checkin”). These people are the 20% that drive nearly 80% of your business and they are the source of the most word of mouth promotion of your venue. This Special is awarded to the Mayor of your venue. The Foursquare Mayor is the most frequent visitor over the last 60 days. This is a great way to reward your best customer and encouraging competition for the crown. In theory the Mayor is your most loyal customer the person who as checked into your venue more than anyone else. At many venues, customers try to be the mayor especially if there is a promotion (incentive) behind it. The Mayor of your venue should be given a special treat, not just a boring offer, be creative and make them feel the king/queen! The reward you offer should encourage them to say good things about your business, so make it worthwhile and make the customer feel proud. Be on alert that a big offer could also encourage abuse. Now that you know what each special is about and what offers to include, get busy creating offers. The process for creating special is simple, follow the Foursquare guide which walks you through each step as you create your 1st Foursquare special. Remember to include terms and conditions when you’re setting up a new special with end dates and limited time offers. Ensure all your staff are trained up on using Foursquare and understand how to recognise and reward Foursquare users. Foursquare provide two sheets you can print off to explain Foursquare to your employees, so they know how to recognise a special, I recommend having that near the pay point somewhere close by. The second is for your customers so they know how to get in on the Foursquare action. Remember that the Foursquare specials are flexible, you can makes changes in real time, run two specials at the same time. Test out the different specials to see which works for you best, use the social networks to spread the word (offer) to more customers. With a winning campaign you could be saving your business huge sums of money and stop advertising altogether, and best of all Foursquare marketing is free for now at least. Not all customers will share their checkins on Twitter or Facebook but getting the Twitter user names of your new and loyal customers provides businesses with an opportunity to reach out, follow them on twitter, and get feedback by asking them to share their experience. When a customer tweets that they checked into your venue if you have a twitter account associated with your venue, then that twitter handle is shared by Foursquare on Twitter, giving you some exposure to new customers. Personal touch and direct communication will most likely bring customers back. Listed below are few more tips on how you can use Foursquare to market your business. Taking advantage of the new local updates feature and by adding an event, read further to discover further insights on Foursquare marketing. The ability to send updates from your venue on Foursquare is a recently launched feature that allows your business to engage with people who’ve previously checked into your location and who are nearby. You can send out specials, coupons, deals, announcements etc, and also include attachments like text or images. Now you can add events like trivia nights, wine tastings, and book signings to Foursquare. This is a helpful way to increase visitors, while syncing interactions with your business online and offline. Foursquare is still a relatively new social network, unique and interactive, connect your real world actions online. Use the free window clings provided by Foursquare, make signs, stickers and put them on your door, and windows to remind customers to checkin. Put a message on your till receipt or have a flyer on your restaurant table asking customers to checkin, leave tips and help to promote your business. 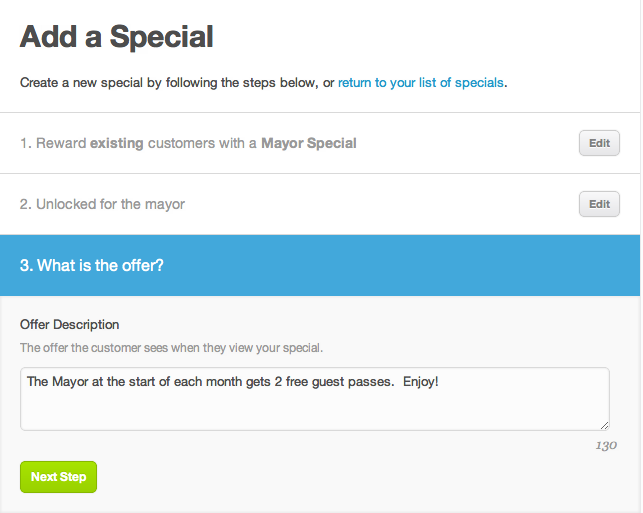 Highlight the “Mayor” status as a Perk; it will encourage Foursquare users to visit your business more often. And also ask them to cross post on Twitter and Facebook. All business have access to the Foursquare marketing tools, creating a to-do-list for Foursquare users is a great way to encourage interaction. Use this to run a promotion or contest, such as the 1st one to visit 5 different restaurants within 3 months, or visit 5 museums/galleries in London and offer the winner a prize. Give users things to do, make the list competitive and fun. The saying goes that 20% of your customers typically bring in 80% of your sales. To build that brand loyalty make sure to look after that 20% of your best loyal regular customers, offer them something sweet to keep them coming back and to spread the word about your business to friends, family and colleagues. One way to increase interaction and reward those who freely share a checkin on Twitter or Facebook is to monitor the share using a tool such as Google Alerts or SocialMention. When someone mentions your business name you will get an email, verify the Tweet or Facebook status and send a message to the customer. Thank them for the business and offer a reward for being a loyal customer. These steps with develop customer loyalty and keep them coming back and spreading the word even more for free. Now that you have a created a presence on Foursquare, lets dig deeper into what other things you can do and what benefits these will bring to your business. You already have a Facebook Page, LinkedIn Company Page, Twitter profile and lots of other profiles on Social Networks, but what are the key benefits of using Foursquare and what can you do to promote your Brand or Business. That showcase your personality and expertise. Tips are tidbits of interesting information about a location. For example, tell your fans the best dish to order at a restaurant. And when a person checks in, they’ll see your tip pop-up on their phone. Users are even prompted to leave tips about places they’ve checked into in the past. Leave tips on locations of other businesses in your area to help grow your authority on a subject and promote your brand in front of customer’s visiting other locations in the neighbourhood. Create a home for your brand on Foursquare by launching a page so that you can connect with your fans and grow your fan base. If you already have a Facebook Page, Linked in Company Page or a Twitter Profile then you should also have a Foursquare Brand Page. Engage with your fans as they’re out exploring the real world, by adding content you’re already creating to Foursquare. Get your brand message in front of millions of users by utilising the banner image, add a message so everyone who visits your page can learn more about your business. With a page, you automatically get added to the Foursquare Page Gallery so the foursquare community can find you. Promote your page using other social media networks and from your website. Add content to engage your fans on Foursquare, tell them about all the great places they should go and provide them with insider tips. While there are key differences between user accounts and brand pages, if you’re managing a brand page you still have the ability to check in as your page. This is a great way to connect with your customers while out and about, especially at notable venues or events.. The most effective brand check-ins are around major public events, like a concert, an awards show, or a sporting event. Create lists and give people the inside scoop on where to go. Use lists to organise your tips by city or a theme for example best restaurants in London, museum, tourist attractions, and sporting venues so they act as pocket guides. How do businesses use Foursquare? Foursquare offers business managers the option to easily view and track data and analytics from their listings. As a manager, you can see powerful information on who’s checking in to your business and how strong their relationship is with your business. Measure how many people come to your business and check in on Foursquare everyday. Use the free analytic’s to learn more about your real-world customers. Meet your best customers. Find out who the mayor of your business is (the person who visits the most). Foursquare provide widgets you can add to your business website so that users can like your business and add follow your brand page straight from your web site. Add the ‘Like’ button to your site and your visitors will see your tips when they’re out exploring the world. Prepare your Foursquare page by making sure you have a foursquare Page with lots of interesting tips for your followers to discover as they’re out exploring! When you add the ‘Save to foursquare’ button to your site, your visitors can easily get foursquare reminders from you when they’re near the places you suggest. When one of your visitors clicks the ‘Save to foursquare’ button on your pages, it save the contents to their to-do list in foursquare. Then, when they’re out and about, foursquare Radar will buzz on their phone when they’re close to it. For businesses it has great free tools to help you get discovered and connect with your customers. If you use Foursquare for business or manage a brand, please share your tips and experience of using Foursquare. Use Digital Media to Promote Your Business! Using WordPress as an E-Commerce Solution?